When trying to connect via NET it shows the "UDP initialization failed" error. Server starts just fine, ports are forwarded(checked with other game). Connecting via LAN works just fine. I hosted a server before and never had such problem. If your server is running on your own computer, connecting via your external IP could cause weird issues. I've noticed this myself when I was messing around with that. I worked around it by setting the server IP to 127.0.0.1, which would mean that if someone connects to the server they would be connecting to 127.0.0.1 instead of my real server. This was fine for me because I just needed it as a dev test server. The problem is nobody can connect to my server. Canyouseeme only tests TCP, btw. 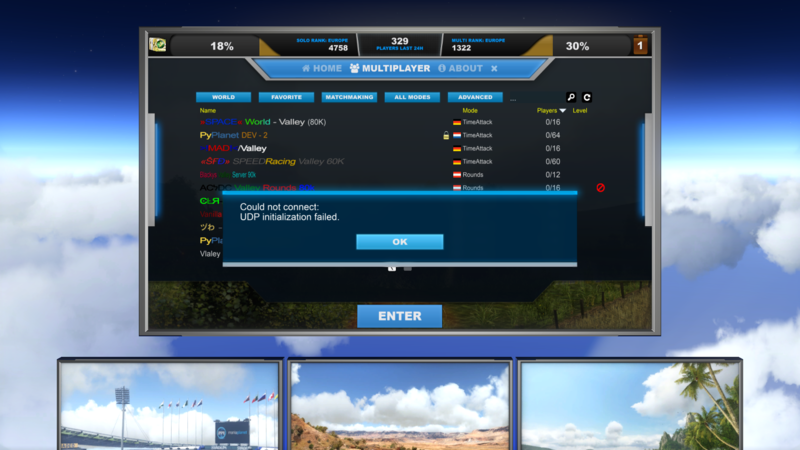 Other people could join my server , I could not play on it trought the internet only local. "Could not connect: UDP initialization failed"
, so i used it. It worked , thanks a lot!